Asus just launch it's new 10 inch tablet, and this is comparison of Asus Transformer TF300 VS new ipad 3. apple launched it's tab first then a month later Asus released this pad. which tablet is better? For display technology Asus is equipped with IPS technology while Apple with Retina Display technology, Well for certain situation like when we see the screen with sunlight over it (outside area) IPS technology is better. Asus user will have great audio experience with sonic master audio technology. user will also provided with supernote application that allow you to make note with photo, video, keyboard and ofcourse fingers. 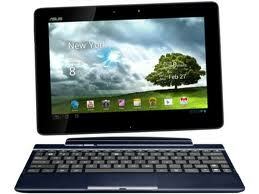 Asus transformer pad TF300 also preloaded with polaris office for document, spreadsheet and presentation working. other free services for user who buy Asus TF300 are asus my cloud, my net and my library. with these services users will have total solution for storage, magazine, movie, newspaper, book, maps, digital TV network, easy synchronization with PC and Mac and so on.